Case Study 1988 to New! Restoring the Shine to a 20 year-old Boat! Orlando Abella is the owner of a 20 year old EdgeWater Freedom 200. 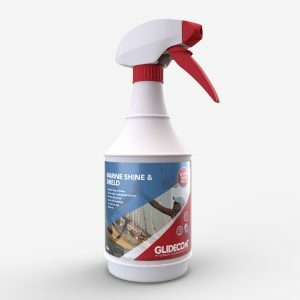 He had recently learned about Glidecoat and what it can do for older boats, providing prolonged protection while bringing back the showroom shine with our marine ceramic coating! 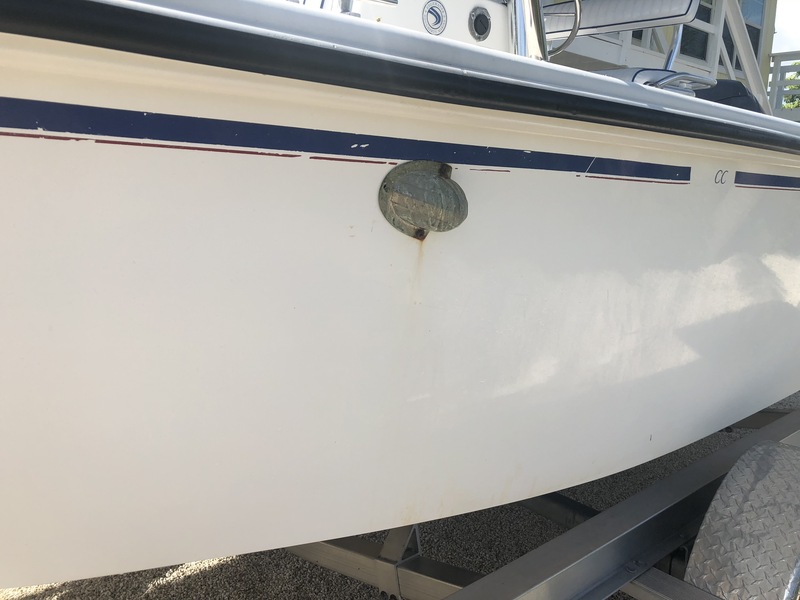 Due to the harsh marine environment, especially in South Florida, boats are subject to severe wear, constant sun damage, salt water, scum lines, fish blood and heavy cleaners take their toll on the surface of a boat. Over 20 years, Orlando’s boat had suffered from the elements, resulting in a boat with little to no shine. 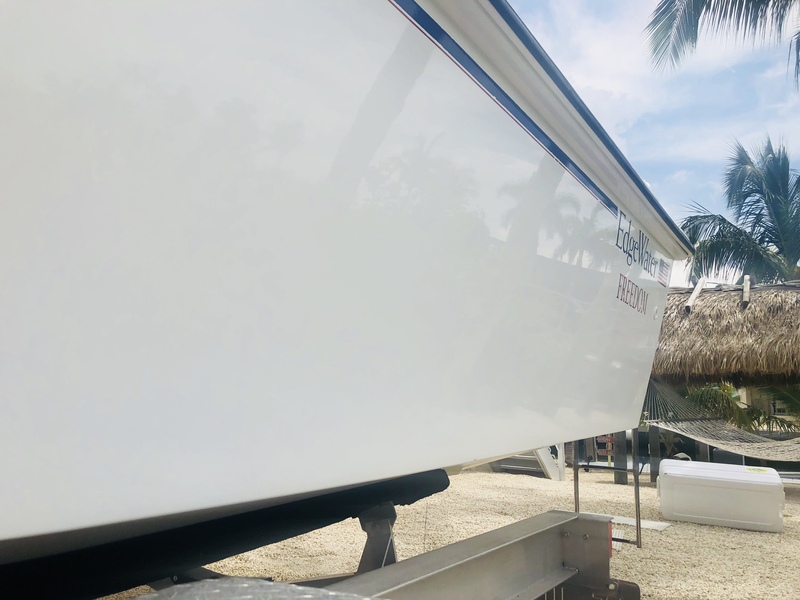 Being a prideful owner, Orlando wanted his boat to shine like the day he bought it, and that’s where the Glidecoat marine ceramic coating comes in! In addition, there was rust and other staining on both sides of the hull and top side. The hull also had large amounts of salt buildup making the surface sticky and rough. We began the process by washing the boat with Nano Wash, a non-abrasive soap, to clean the surface before buffing. The second step is to compound and Nano Polish all flat fiberglass areas, both on the topside and hull. 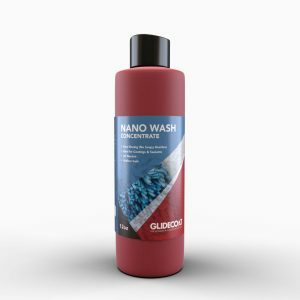 Because this boat was 20 years old and had lost most of its shine, the use of a heavier compound was required before the use of the Nano Compound. We used a wool cutting pad and heavy duty compound on the hull. This step was completed twice in order to remove most of the heavy oxidization and blemishes on the hull. We then moved to a clean wool pad and Nano Compound, which started to recover some of the shine while continuing to remove any leftover oxidization. The final buffing step consisted of another clean wool pad and Nano Polish. 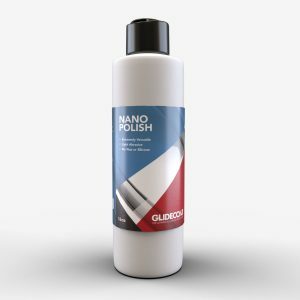 The Nano Polish helps further restore the shine of the surface, bringing us closer to that showroom finish! 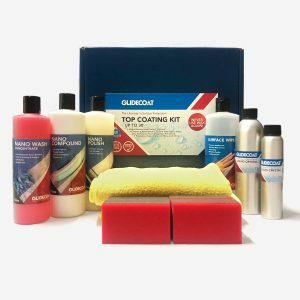 We start by pouring a dime sized amount of marine ceramic coating onto the red application sponge. Working in 2’ by 2’ sections, we apply our coating onto the surface. When applied the surface will appear to be “sweating”, we then buff the area with a clean microfiber cloth, working the coating into the pores while removing any excess liquid from the surface. This process is completed across the entire boat. Once the first coat is completed, we repeat this step and apply a second coat of the marine ceramic coating. The boat is brand new! I can shave on it! Thank you!!!" Once the coating has fully cured, between 8-12 hours, the result is nothing short of amazing! Glidecoat was able to take this tired 20 year-old boat and transform it back to a finish that rivals even brand new boats. At the beginning of the Glidecoat process we took gloss meters readings of the topside and hull that ranged from 17.5 to 36.6. 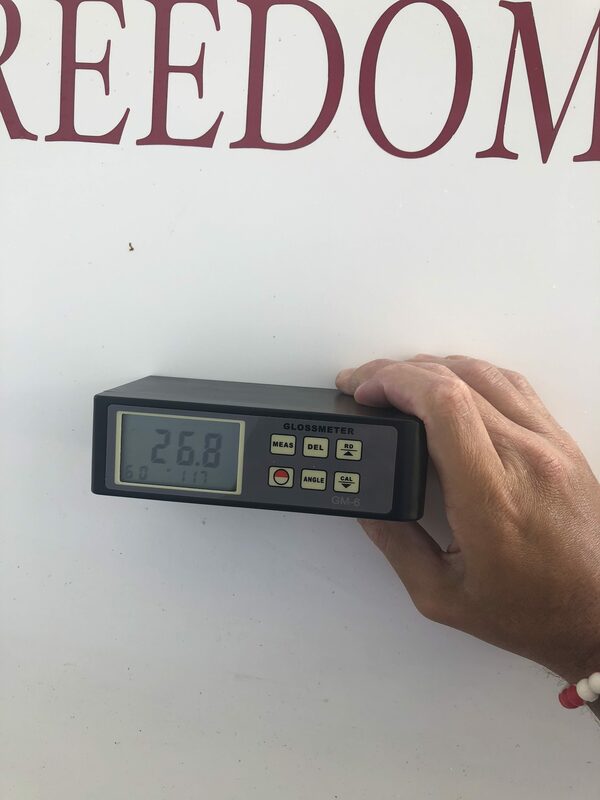 After the Glidecoat process and application of marine ceramic coating those gloss meter readings jumped all the way to 89.1! That is consistent with a brand new boat coming out of the factory, which is pretty amazing for a boat manufactured in 1998! After allowing the coating to cure 8-12 hours we again used the gloss meter. Now readings had climbed from the 17.5 to 89.1 after completing the five (5) stage process and applying our liquid crystal. 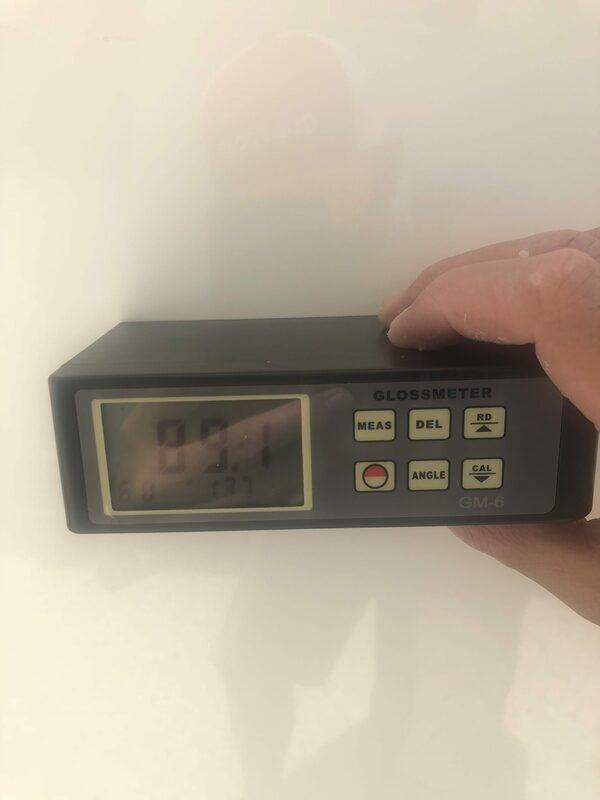 To provide you with a frame of reference, brand new gel coat out of the factory will render gloss meter readings from 82-88. The white hull with glossy finish that you can perfectly see the reflection of the background.